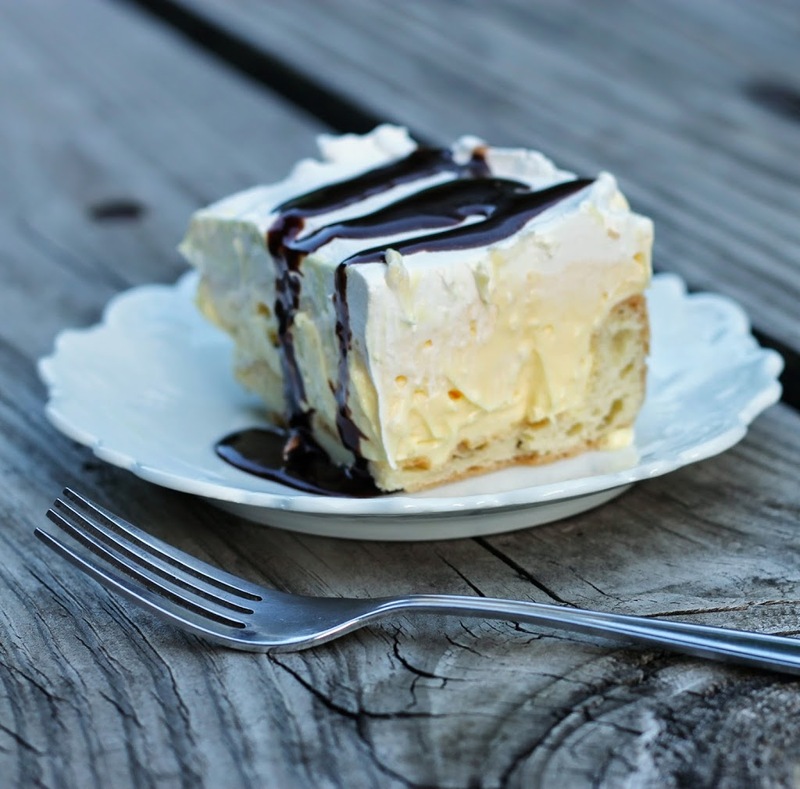 Cream puff cake… an easier way to enjoy cream puffs. I love cream puffs; those delicate pastries filled with pudding or whipped cream and frosted with a chocolate glaze. I could probably eat a dozen in one setting, well maybe not a dozen, that may be a little of an exaggeration. But none the less I love them. But let’s face it they are a ton of work and take forever to make. So when I ran across this recipe quite a few years ago let just say, it caught my eye. The ingredients are the same as when making individual cream puffs, but the dessert is baked in a 9 by 13-inch pan and is so much easier. I do have to admit this dessert is not as cute as the individual cream puff, but the result is just as tasty and it will definitely get you out of the kitchen sooner. 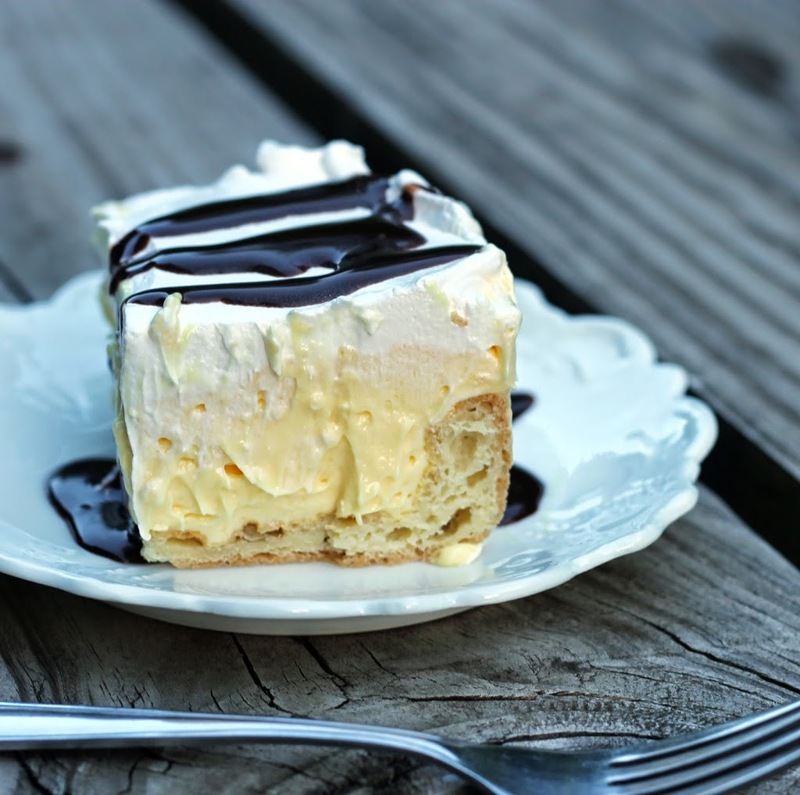 So if you love cream puff and you don’t want to put all the time and effort into making the individual pastries you really need to try this cream puff cake. I have made this recipe for birthday parties and other gatherings and it is always a hit. 2. In a large heavy saucepan, butter and water and bring to a boil over medium heat. Add the flour and stir quickly until the mixture form a ball and pulls away from the pan. Remove from the heat and add eggs one at a time. The mixture is will be hot so when adding the eggs start beating right away with a wooden spoon to prevent egg from cooking. Beat well after adding each egg. 3. Spread in bottom and up the sides of an ungreased 9 by 13-inch pan. Bake in preheated oven for about 25 to 30 minutes or until pastry is lightly browned. Cool completely. 4. To make the filling bring the cream cheese to room temperature. Place the cream cheese in a large mixing bowl and beat for a minute or two. Slowly add the milk to the cream cheese (do not add all of the milk at one time, the mixture will end up lumpy) and beat until smooth (there may be some small lumps of cream cheese, but that will not affect the taste of the filling). 5. Once all the milk is add and this mixture is smooth add the pudding and beat until thick. I like to add about four ounces of cool whip to the pudding mixture to lighten up the pudding. 6. Spread the pudding mixture over the cooled pastry and top with your cool whip. 7. When serving drizzle with chocolate syrup. 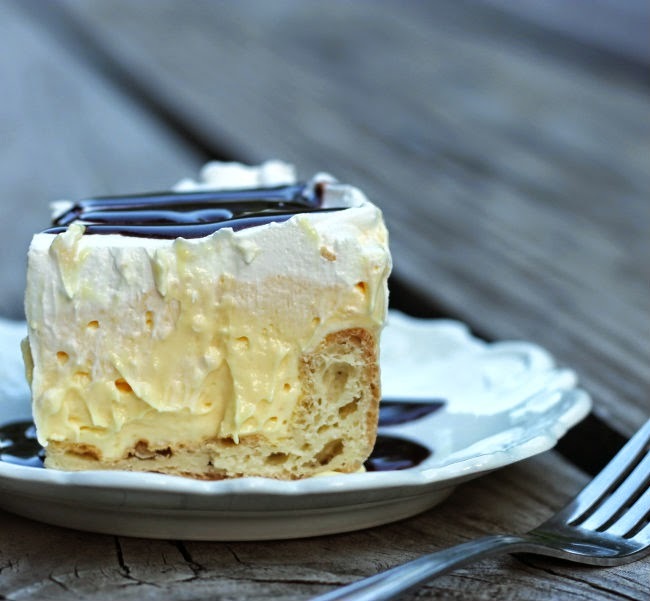 (Cook’s notes- If you are afraid of the lumps from the cream cheese you can make a pudding for the filling and omit the cream cheese. Also Cool Whip can be replaced with whipped cream). Wow. Cream puff taste with much less work. What a great idea. Loretta, thank you for stopping by. I like your ideas for changing this recipe up. They all sound yummy! I hope that you will stop by again. What a gorgeous dessert! The filling looks exquisite!